I found it interesting how old fashion recipe becomes an all time rave! The simple biscuit cake is now called the Prince William's groom cake. I used to love biscuit cake when I was growing up. It was a treat at tea time. The recipe is quite simple. No baking necessary. We didn't put any glaze on it. Just store it in the fridge and I would get a piece after school! As I get older, the more I realize how fortunate I am to be raised in a few different cultures. The only regret: Sorry Grandfather, I didn't turn out to as prim and proper as you would like me to be. Line a 6 or 8" cake pan with plastic wrap with about 1.5" overhang. Set aside. In a large bowl, break up the biscuits into large pieces. Set aside. In a med size saucepan, combine chocolate chip, Golden syrup and butter. Combine the mixture till the chocolate is melted with a smooth consistency. 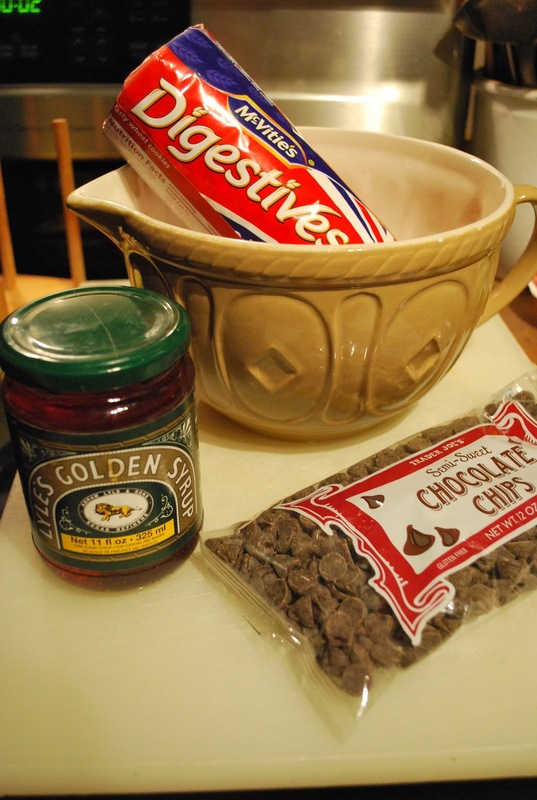 Remove from heat, pour the chocolate mixture over the biscuit. You can use a measuring cup to make a even surface. You will crush the biscuit, don't worry that you put too much pressure on the cake. Place the cake in the fridge for about 3 hours or overnight. In a small bowl, combine chocolate, cream and butter. Melt in the microwave for 1-2mins. Return the cake back to the fridge till the glaze is set. I used the ready make frosting I was going to use for my little "acorns". Oh... those little acorn, I saw it on Pintesest, here is my version. Fun to make with kids! Ready to use chocolate icing. Put a small amount of icing on each of the Ritz Bits. Pipe a little stem on the other side of the Ritz bits. You got acorns! We usually make it a loaf pan. It's easier to cut. As with pattern, I simply dragged a fork on top and side of cake in both directions. Truly a kids delight…looks terrific!! It's a very simple recipe. Hope you enjoy it!